I’ve decided to skip the travel log with recipes for a couple of posts, since here’s so hot these days. Now that Charon decided to mellow down a bit, it is possible to use the stove a little. So I’ve decided to pass on a couple of japanese cold recipese, and here goes the first one: cold ramen. 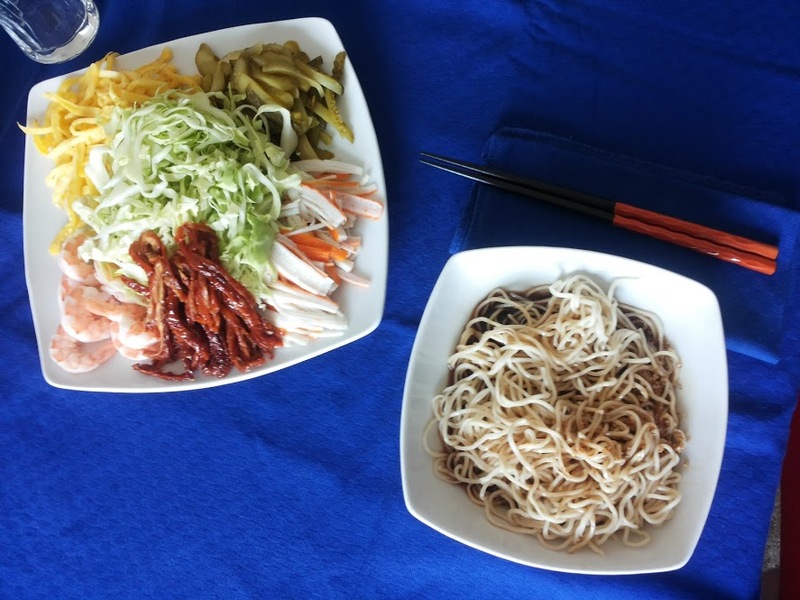 Somehow it can be compared to an italian pasta salad, all you need is noodles (or soba, or udon, your choice), a sauce that is a mock-broth, and any type of condiment you like. First thing first make the sauce, so that it can refrigerate while you’re preparing the rest. Please trust the recipe, don’t start with “What? Sugar with noodles? I’m skipping that. And regular vinegar will do just fine, just like regular oil” because I have absolutely no clue on how it will turn out (I doubt any good), but most of all I’m sure it will loose that “japanese flavor” that the sauce delivers. Trust me, trust the recipe, the sauce makes the difference. Now chop up all the other ingredients, make everything matchstick shaped. If you’re making this in advance, put everything into a plate, cover with film and store in the fridge. Cook the noodles according to your package. Don’t put salt in the water: asian noodles already have some salt in them. There will be plenty of salt with the sauce anyway! Drain and rinse them under cold water. Wash away the slimy texture by gently rubbing the noodles together. Drain well again and toss them into a bowl filled with icy water. It stops the cooking process and makes them nice and chill. Divide the portions, put your ingredients of choice and pour the sauce over it. Eat with chopsticks and a “slurping” sound!! !